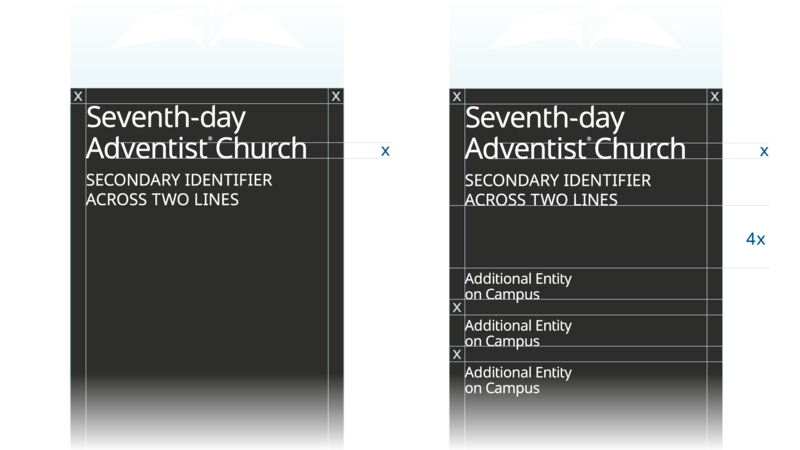 One of the most important applications of the new identity system is the signage system, which for many will serve as a their first interaction with a Seventh-day Adventist entity. 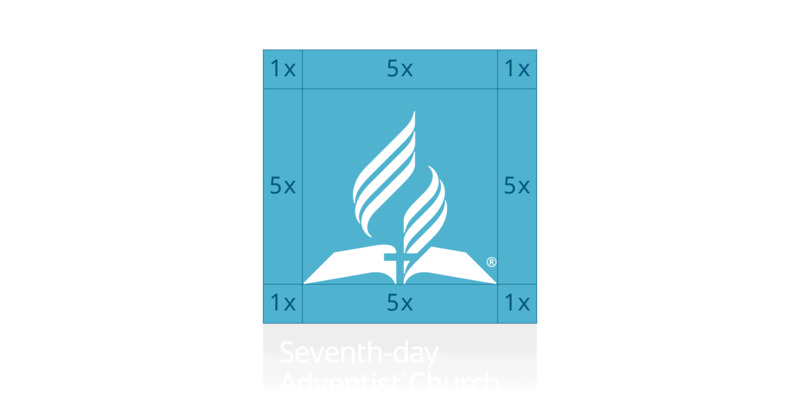 While interactions with print pieces or websites allow users enough time to identity elements like the Sabbath Column, Adventist Symbol, and Advent Sans, signage is often seen for only brief amounts of time, and therefore it is incredibly important to highlight key elements and allow text to be as legible as possible. Creativity is encouraged when designing materials that people have time to look at and study, but with signage it becomes much more critical to give viewers something they can recognize instantly. As a result of the limited viewing time—especially if a viewer is driving—the recommended approach for signage is free-standing, vertical signage. In areas where vertical signage is not allowed or appropriate, a horizontal version is appropriate. Specifications for horizontal versions, as well as on-building signage, will available shortly. 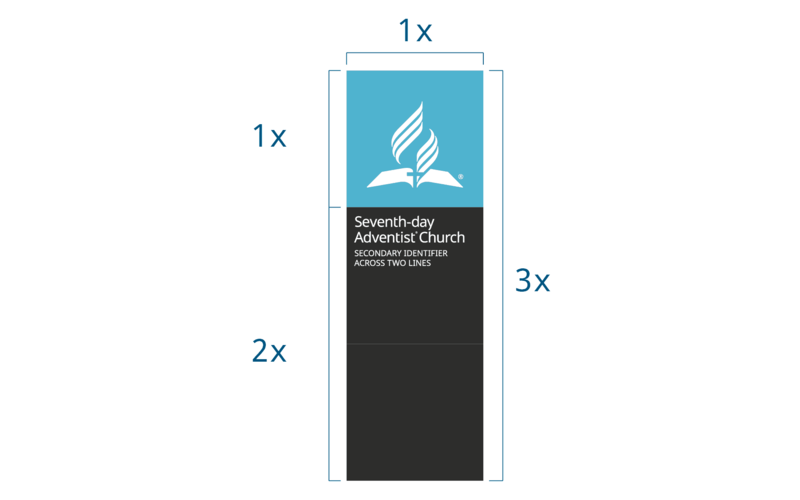 It is important to maintain the following proportions for vertical signage. If you need a taller or shorter sign, make sure to scale the width proportionally. 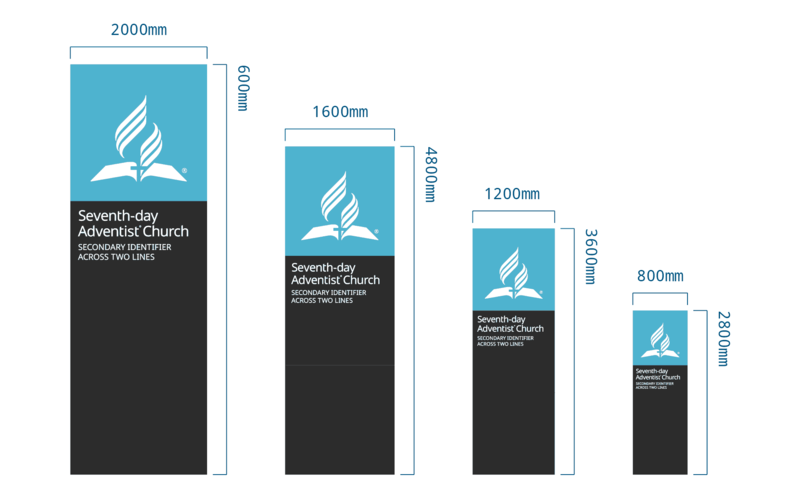 The following image demonstrates recommended sizes for vertical signs. When deciding on the size of your sign, think about who will be viewing it, and at what speeds they will be passing by. The recommended spacing for the symbol within the square area is based on a 7-unit grid, with the symbol sized at 5 units of width. The spacing of text within the vertical sign is based on the x-height of the primary identifier. If the name of your entity is longer or shorter, adjust the spacing proportionally. If your entity name is too long on two lines to remain legible, please contact our offices to determine an appropriate size and arrangement of text. 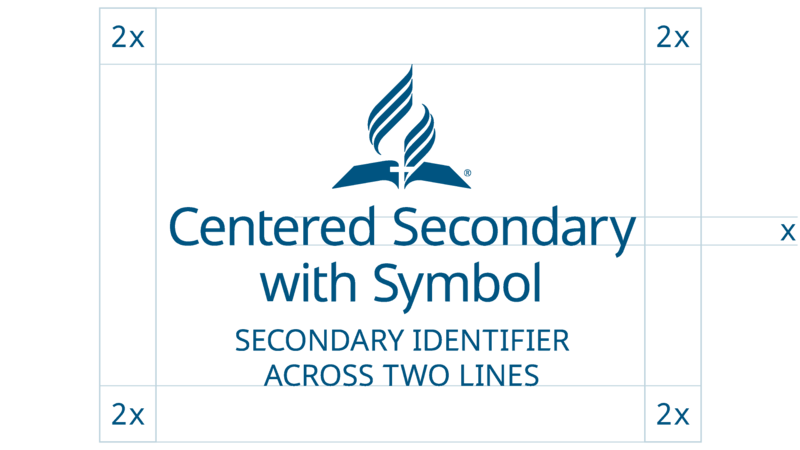 It is important to consider the relationship between the primary text and secondary text in the entity identifier. The maximum size for secondary type is 75% the x-height of the primary type. If the secondary type is very long, it can be reduced to a minimum of 50% of the x-height. 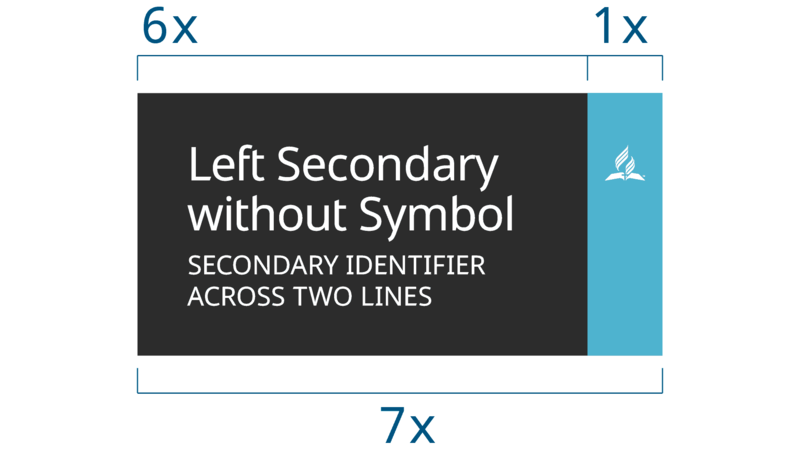 Horizontal, on-ground signage may be appropriate in some cases, and when creating it is important to use the Creation Grid to determine the proportions of the sign. If your have a long name, make sure to increase the width of the whole grid proportionally. If you have a shorter name, you may decrease the width proportionally. Having more space to the right of the identifier than on the left is acceptable, but having less space on the right than on the left is not. 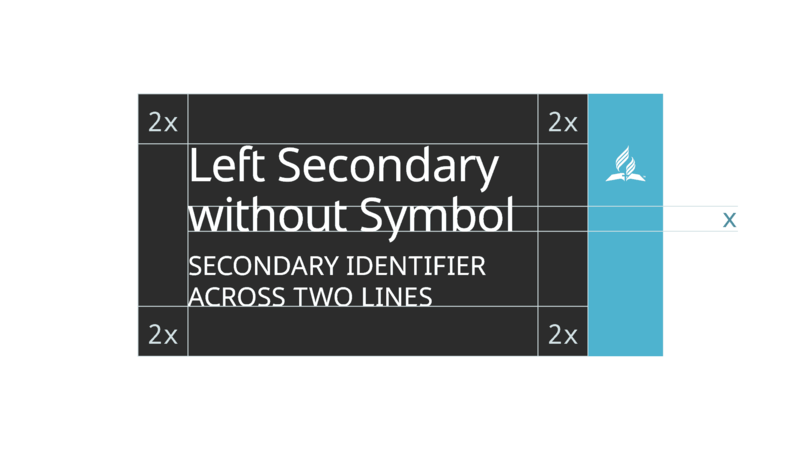 The spacing of text within the horizontal sign is based on the x-height of the primary identifier. If the name of your entity is longer or shorter, adjust the spacing proportionally. 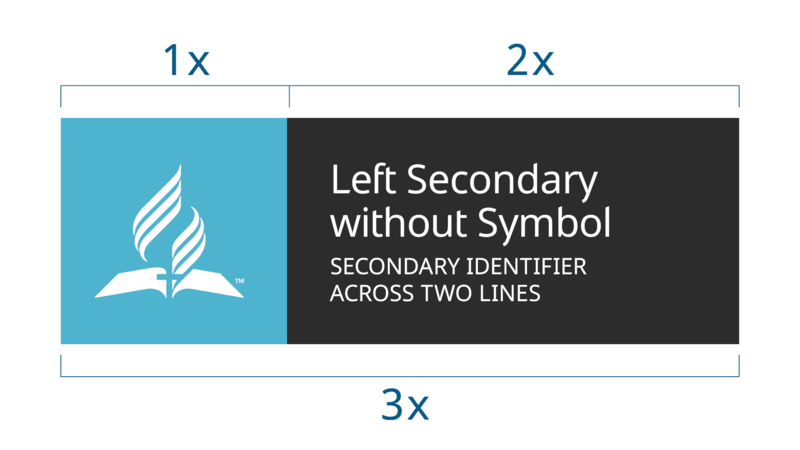 An alternate option for horizontal signage is to use a large-symbol, left aligned in a square container, based on the same 1:2 proportions of the vertical signage. On-building signage can be created using the same specifications as the horizontal signage above, provided that the entire horizontal structure (the 6:1 or 1:3 container) is mounted as a unit onto the building. An acceptable alternate approach is to mount the elements of the entity identifier directly to the building, using the same proportions detailed above with the following clear space applied. If your institution isn’t yet at the place to update to new a new signage system, it is appropriate to continue using your current signage until you have the resources to properly execute the preferred signage options. If municipal code, architecture, or space does not permit the use of one the above options, and you are required to fit the identity into existing hardware, please contact [email protected] to discuss appropriate solutions.